You can easily create an organization chart us­ing the Hierarchy Smart­­Art diagrams, but you can also make it interactive in PowerPoint using called actions. 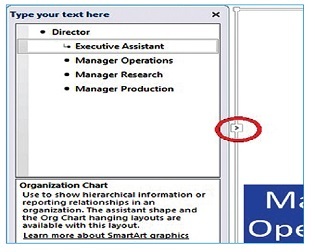 You may click either the SmartArt button on the Insert tab, Illustrations group, or click the SmartArt icon in the Content Placeholder in a slide with the Title and Content layout. Select the best diagram to communicate your message. Once you choose the diagram, you’ll either notice a “Type your text here” box or a button that looks like a less than symbol. If you click this button, you’ll see the “Type your text here” box appears. For those SmartArt types that have multiple levels, such as an organizational chart, use Tab and Shift+Tab to arrange boxes at superior and subordinate levels. Simply deselect the diagram (click anywhere else) to make the “Type your text here” box disappear. From the Choose a SmartArt Graphic dialog box, Hierarchy category, select one of the listed diagrams. The first, Organization Chart, is the simplest one. By default, it contains a top-level position, an assistant and three sublevels. Use arrow keys rather than the Enter key to enter the default levels. To create a fourth sublevel position, simply press Enter after the third one. Each time you press enter, another shape at the same level will be created. To create a staff position to one of these sublevels, press the tab key. Here, as well, pressing Enter after each one will create another staff position. To create another position at the superior level, press Shift+Tab. Actions allow you to attach an event by either clicking on or hovering on an object, like one of the rectangles in an org chart. Say you’ve added a slide in your presentation containing the contact information and photo for each person represented on your org chart. Using actions, you can click on a role, see that information, and then quickly return to the org chart. First, select the shape on your org chart that you want to link to a detail slide. Make sure you see the handles around the shape, not just the frame around your diagram. Now, on the Insert tab, in the Links group, click the Action button. To make it a mouse- click to the associated slide, be sure you are on the Mouse Click Tab. 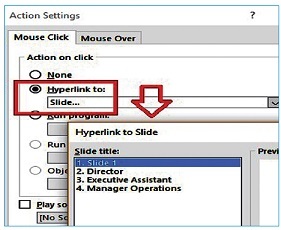 Then, click the radio button for “Hyperlink to.” In the dropdown box, choose “Slide ... .” PowerPoint will bring up a list of slides in your presentation. Click that role’s detail slide here, then OK.
You’ll want to put a shape on this target slide to enable you to return to your org chart. You can do that with a plain rectangle. Just insert an action that returns to the slide with the chart. PowerPoint 2003 to 2013: Where'd they put...? We also have an org chart software that has interaction. Similar to PP we also have the ability to link URL’s. You can even link to other diagram as well. This way you can have the main corporate org chart and link to other smaller ones from the main one.